Contains most of the same text and high resolution graphics found in the CD-ROM program. Printed in the USA with card stock cover and bright white paper. The Ruger .22 is the best selling .22 pistol in the world. Since its introduction in 1949, the Ruger .22 Standard Model pistol quietly took over the .22 pistol market. Its good looks, superior performance and very reasonable price tag gave it an instant advantage over long established brands on the market such as the High Standard or Colt Woodsman. Americas shooters found a .22 pistol that delivered solid value and outstanding performance for the money. Since 1950, the demand for these Ruger pistols exceeded supply. Ruger enjoyed a back-order condition into the mid 1970s. 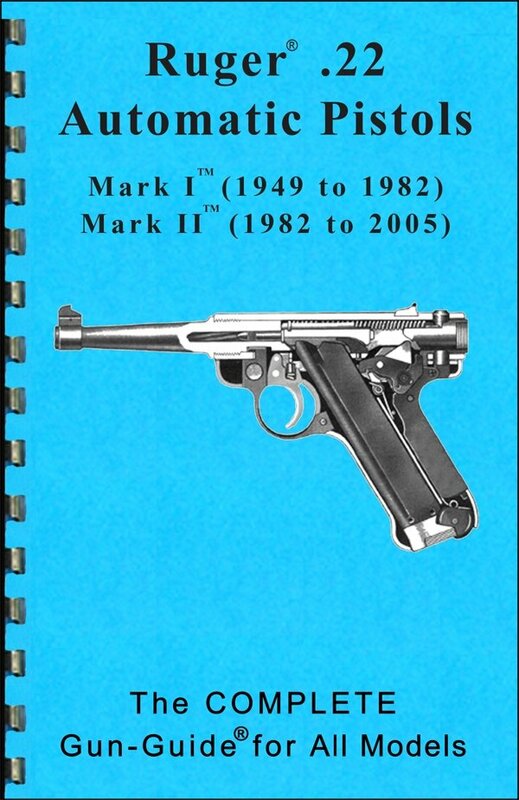 In 1951, The Mark I Target Pistol was introduced, with an adjustable rear sight and a 6 7/8 barrel. Cost: $57.50 During 1952~1953 Ruger produced a Mark I with a 5 1/4 tapered barrel. Due to lack of interest, this version was dropped from production. It remains one of the only Rugers ever discountinued as most have been replaced by design improvements. This short-lived model is sought after by most pistol collectors. In 1955, Ruger made an aftermarket muzzle brake available, but it was discontinued. Ruger introduced the Bull Barrel in 1964. These 5 1/2 inch barrels have a front sight base attached by screws. In 1971, the black emblem was moved to the right grip panel. All Standard and Mark I pistols made in 1976 have barrels stamped with Made in the 200th Year of American Liberty. All Ruger firearms since 1977 have the roll marking on the barrels that say: BEFORE USING GUN - READ WARNINGS IN INSTRUCTION MANUAL AVAILABLE FREE FROM STURM, RUGER, & COMPANY, INC., SOUTHPORT, CT., USA.